Heat the oil, add the onions and cook till the onions turn golden brown in colour. Add the ground paste and tomatoes and cook till the oil separates. Add the vegetables, salt, garam masala and ¾ cup water and bring it to a boil. pooja why have u copied the recipe from tarladalal cookbook? atleast apply ur mind and submit ur own creation. 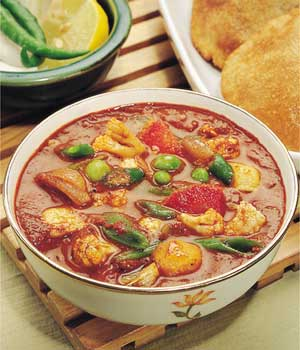 This dish is similar to veg korma in tamilnadu. Difference is here we add green chillies .Any let me try with a difference.